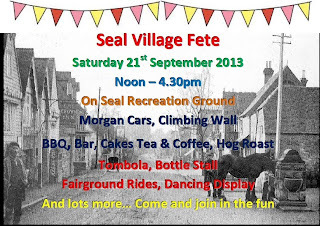 If you missed your chance to sign a tile for Seal Church's roof appeal on Saturday at the fete, don't despair. They will be available for signing in Seal Library, in the High Street (TN15 0AL) tomorrow (Sat 28th, from 10.30 to 1.30pm). Make yourself history as "your" tile is put on the organ loft roof - who knows who will one day read your name next time the roof is repaired! £5 per tile. There will be a fete planning meeting on Thursday 5th September at 7.30 in the Church Hall. All are welcome to come along and add their talents and skills to the bank of people we already have. As you will be aware, the fete takes place on Saturday 21st from 12 noon until 4.30pm. We still need volunteers to assist with setting up, clearing away, and manning a few stalls. The programme looks good, but we do still need some extra pairs of hands to help out. Look forward to seeing a good throng on Thursday - only 2 more meetings after this one! Present:- Anne Le Bas, Nicky Harvey, Eleanora, Jo Argyle, Peter Mountfield, Chris Rampton, Maggie Fox and Marion Gilchrist. Creed Outdoor Learning have confirmed they will attend and we have a copy of their PL Insurance. They will man this themselves and give a donation from their takings. Grenville Allen has had to decline. Andrews have not responded to having an advertising banner yet. Fox Archery have had to back out due to lack of people to run the event. Sevenoaks Boxing have also had to pull out. Chris has not yet heard from Gymboree – to be contacted. We will not go ahead with Sunflower Lettings boards due to lack of response. We now have several lots for the silent auction, but still need more. Ben Colnett is providing the PA system and music. Due to lack of response from various contacts, we will not be having the dog show this year. The extra evidence for the Public Liability Insurance now is ready to send off. 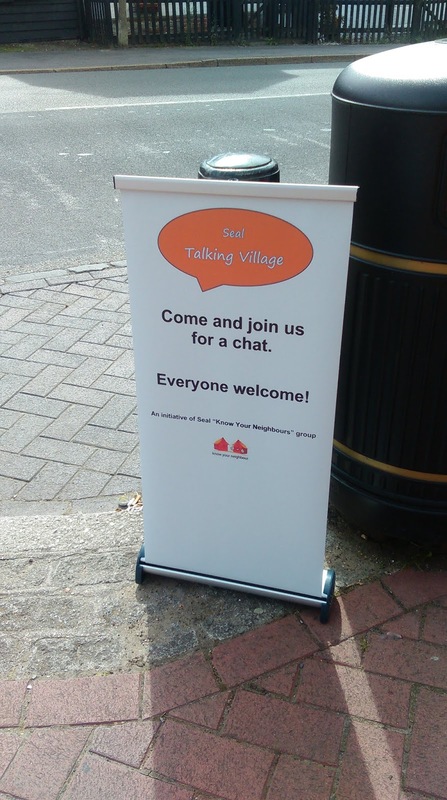 We discussed the banner and agreed to have one made just advertising Village Fete Here Saturday with KYN logo and transferable dates. Robert Martin is bringing his hog roasting machine. Sally still has to contact Rafferty’s, The Vine, Tesco and Sainsbury’s for donations of prizes or auction lots. No news as yet from Anna about the boot camp organisers. Peter has approached Seal Chart Studios, but we won’t hear until they return at the beginning of September. Marion will e mail Radio Kent, KFM, and Around Sevenoaks to place ads. Eleanora will e mail The Vine. David Williams is changing the dates on the roadside boards and will contact Marion when they are ready for collection. Nicky will ask the school if we can still use the playground for parking. We decided not to have a programme printed this time, but to have a large display board on the Pavillion showing the programme of events and thanking people who have supported,. They will then be thanked through The Local Advertiser and The Chronicle. KYN stalls will include Tombola, Bottle Stall, and a cake stall if we have sufficient after the Tea stall has taken what are needed. Chris will make some doggy bags containing the bandannas and other bits. Chris will send the posters to us electronically, now that we know there is no dog show. CAN YOU HELP WITH THE FOLLOWING PLEASE? We still need more people to offer to man stalls on the day. We still need more offers of help to set up and clear away on the day. We still need people to encourage anybody to hold commercial stalls. We still need people to find donations of good auction lots. 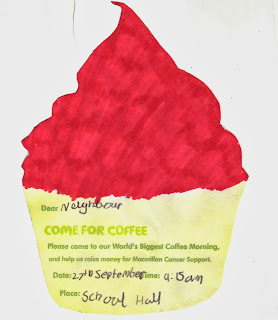 We will also need some help on Saturday 14th September from 10 – 11am, to put up some bunting and the banner. Thursday 19th September 7.30pm Church Hall. Please do join us or e mail me if you can assist but not make the meetings. 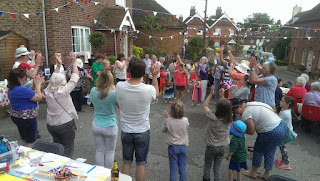 The next planning meeting for the fete is on Thursday July 4th at 7.30pm in the church hall. Notes From Seal Know Your Neighbours Fete Planning Meeting Thursday June 6th. Seal Fete and Dog Show Saturday September 21st. Several more stalls have been booked since last month’s meeting. However, we are still looking for more commercial stalls to swell the revenue. Some great ideas were brought forward tonight from people who had gathered information and business cards from stall holders at other local fairs and fetes. These include an artist from Iden and an outdoor learning company who bring a climbing wall. Both these will be approached to see if they would like to attend. If you are attending anything similar in the near future, please send on any information you may have of people who may be willing to participate. If you speak to them yourselves, please give them Chris Rampton’s details. (01732 763585). Ray and Dot suggested we approach Kent Fire Service to see if they would be willing to have a stand where fire safety demonstrations could be arranged. They will contact KFS and get any information. They also found a very interesting display of vintage Morgan cars at a fete further down in Kent, and we discussed the possibility of seeing if we could have something similar. Brands Hatch Morgans at Borough Green will be approached. Anna suggested we might approach Harrington’s Nursery in Swanley Village to see if they might donate some plants for a stall. This is the nursery that supply the village planted tubs for the Parish Council. Marion will see to this. Sally Thompson is going to approach Sunflower Estates to see if they would be prepared to advertise via bill boards outside properties as they do for Seal School. If this is a possibility, please consider whether you would be prepared to have a board outside your property to advertise this event. It is a good source of extra revenue, so please let me know if you would be happy to take part in this. Marion will approach Andrews Estate Agents to see if they would be happy to erect a banner and make a donation as they did in 2011. Anna is getting information about a pet stall who may wish to take part. Jo and Sally have kindly offered to work together to approach local businesses for donations for a silent auction. Jill brought the information about Public Liability Insurance, which was discussed and will be sorted out in the next couple of weeks. ‘Dangerous activities’ taking part will need to provide their own insurance. This will include the bouncy castle. Archery and the fun fair rides. Seal Village Association to be approached for the cost of this. Nicky is also going to need funds up front for Mr Bouncy Castle. As we have had problems with the PA system over the past couple of events, Marion will approach Ben Colnet to see how much he would want to provide this service. He did a great job at Seal School a couple of weeks ago, and there were no problems with music for the displays. Unfortunately, Sue Harwood will not be able to organise the dog show this year due to a very heavy workload. We will miss her input. Anna is going to approach The Sevenoaks Veterinary Practice to see if they might want to organise something along these lines. Gymboree, the childrens’ activity class in Seal Hollow Road, Seal Belly Dancing and Zumba, and Seal School Street Dance will all be putting on displays throughout the afternoon. We have a very healthy list of people willing to volunteer for stall holding, setting up and clearing away. One area which is always in need of more people to volunteer, is the collection of tressle tables from the halls, and the delivery back in the evening. If you feel you could help with this (especially if you have access to a trailer), please let me know. The next meeting will take place on Thursday July 11th at 7.30pm. Please do come along and put your ideas forward. You will be made very welcome. We have started planning for the village Fete on Sept 21. We are actively looking for prospective stallholders, so if you have something to sell, or know someone who might, please get in contact. Pitches are £25 (£35 for a double), but charities are free. Happy New Year to you all (though it probably doesn't seem quite so new anymore). 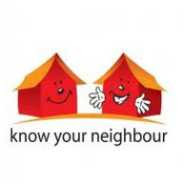 We will be holding 3 drop-in sessions of Know Your Neighbours in February. We have decided to make 3 sessions at different locations and differing times of day. Hopefully, we will be able to reach more people this way! It would be great to see as many of you as can come, and please encourage anybody that has not been along before. 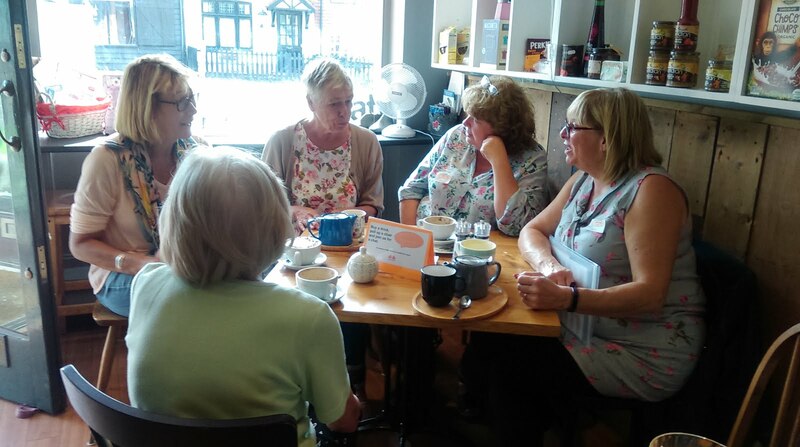 If you belong to any local organisation, please do bring along any literature on your group, so that we can promote and help to grow them with potential new members. Saturday 9th March - Seal Scouts fund-raising event - WATCH THIS SPACE FOR MORE INFO. Sunday 30th June Seal Church Patronal Festival Strawberry Tea. Friday December 5th Seal Church Hall for 'Christmas Chaos' - Make Your Own Christmas Decoration Evening. Please help us to add to this list by giving your ideas, time and talents! As usual, we will be begging for help for all of these events, so if you want to commit yourselves now, you will be more than welcome to contact me! We look forward to seeing as many of you at one or more of these Drop-Ins as possible. Anybody who can spare some time to meet and greet, please let me know!